The Kunsthal worked hard in close collaboration with Fabrique Rotterdam in 2015 to develop an innovative new website that underlines the dynamic character of the Kunsthal. The result is a colourful website that is different from regular museum websites and also meets all the requirements of online experience. The website was launched in October 2015 and has by now won the IF Design Award and a bronze European Design Award. The Fabrique design studio developed a rich and surprising website that reflects the highly diverse programme of the Kunsthal. The striping in the design matches the routing and signs in the Kunsthal building that had been developed previously by Teldesign. 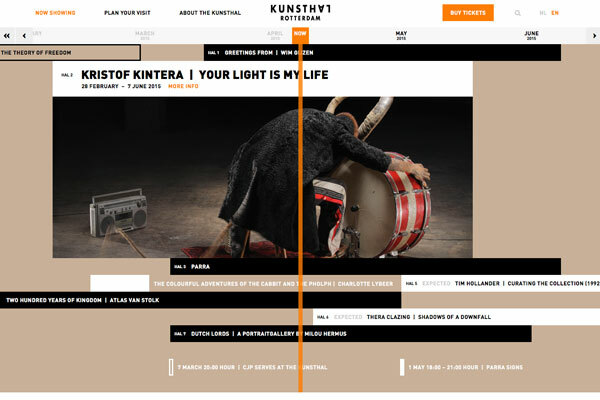 The timeline on the homepage shows what there is to see and do in the Kunsthal now and what is coming. At the same time it presents a chronological and colourful survey of the Kunsthal’s 24-year history. The website invites you to wander through exhibitions and make discoveries as you swipe and scroll, from modern masters and contemporary art to forgotten cultures, photography, fashion and design. The many activities also return on the home page and on a survey page and emphasise the Palais des Festivals feeling: there is always something to do in the Kunsthal. Linking various data that arrive through the website forms part of a new approach to the CRM system. An internal working group is occupied with this, which will complete its work in 2016. 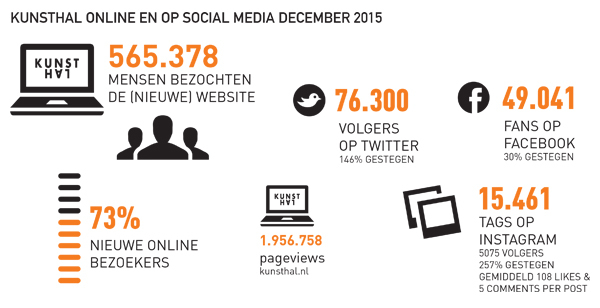 In the statistics of museums and their followers on the social media, the Kunsthal is proud to top the list of Rotterdam museums for outreach and activity on the social media channels. One of the marketing targets, namely to increase our online position, has been attained with a substantial growth of followers on all the social media channels. Numerous photos and snapshots that visitors took of the photogenic exhibitions went online all over the world. The enthusiasm of the public led to many recommendations by word of mouth, and notices by friends, fans and followers worked online like an oil slick. Online ticket sales have been actively promoted for the major exhibitions in the Kunsthal since 2012. A growing number of visitors appreciate this extra service because with an e-ticket you do not have to queue and can go directly to the fast lane. The growing number of e-tickets by comparison with regular ones sold at the cash desk is an interesting trend. It was therefore decided in 2015 to offer e-ticketing as a regular facility instead of as a temporary option for blockbuster exhibitions. Communication about e-ticketing is mainly done via the main exhibitions (Krištof Kintera and Keith Haring) with the message ‘Buy your ticket now’ on trailers, banners, adverts and the social media. Various actions have also been organised to stimulate e-ticketing such as a discount on an e-ticket in combination with an audio tour for the Keith Haring exhibition, or an e-ticket in combination with Freaky Drinks. A total of 5,934 e-tickets were sold in 2015. This is less than in 2014, when 11,000 e-tickets were sold during the Bond exhibition. This is because the Bond target group was more used to buying (film) tickets online than the public for an art exhibition (in Rotterdam). All the same, with these statistics the Kunsthal is still ahead of the other Rotterdam museums. Even better results can be expected from the joint e-ticket platform for Rotterdam museums that will be launched in 2016.